Brevipalpus californicus (Banks), sometimes called the omnivorous mite in the United States, has an extensive host range and may cause economic damage, depending on the host. Mites in the family Tenuipalpidae are called false spider mites (they do not spin a web) or flat mites. Figure 1. 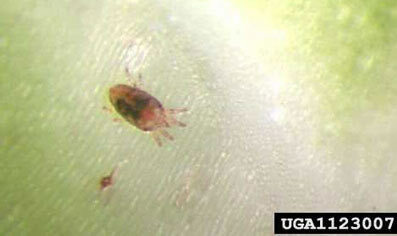 Adult false spider mite, Brevipalpus sp. Photograph by Rayanne Lehman. Banks (1904) described this mite as Tenuipalpus californicus from specimens collected at Redlands, California, feeding on oranges. McGregor (1949) placed it in the genus Brevipalpus. Brevipalpus californicus has been reported from Algeria, Angola, Australia (as "bunch mite"), Brazil (São Paulo), Congo, Cyprus, Egypt, the European Union, French Guiana, Greece (including Crete), India, Israel, Italy (including Sicily), Japan (Ryukyu Islands), Libya, Malaysia (Peninsular), Mauritania, Mexico, Mozambique, Nepal, Papua New Guinea, Portugal, Senegal, Sri Lanka, South Africa, Thailand, the United States, and Zimbabwe (EPPO). In the United States, it is reported from Arizona, California, Florida, Hawaii, Kansas, Louisiana, Maryland, and Texas. In Florida it has been reported from the following counties: Alachua, Baker, Brevard, Dade, Duval, Hillsborough, Indian River, Jefferson, Martin, Orange, Palm Beach, Pinellas, Polk, Putnam, Sarasota, Seminole, and Volusia. The female is 228 microns long. Immature specimens are reddish and adults are rufous amber. The body shape from above is ovate-sagittate with the width approximately 2/3 that of the length. The dorsal cuticular surface of the body is conspicuously reticulated. Figure 2. Dorsal view of a typical female false spider mite, Brevipalpus sp. Figure 3. Ventral view of female false spider mite, Brevipalpus californicus (Banks). The areolae on cephalothorax laterad of the mandibular plate is about 1/3 longer than wide. Dorsally, the cephalothorax bears three pairs of rather weak setae; one pair at the anterior margin between coxae one, one pair just in front of the eyes, and one pair just behind the eyes. The abdomen bears 20 very weak setae dorsally: seven along each lateral margin from the main suture back to the caudal tip; three submedian pairs, the first near the main suture and the second and third pairs opposite the second and third marginal setae, respectively. 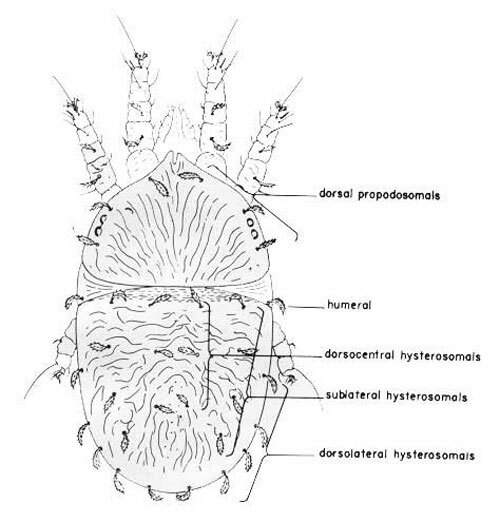 All dorsal setae appear to be simple, unpectinate, and unserrate. A pair of dusky-bordered pores opens dorsally on the abdomen, a short distance behind the main suture. The legs are short and stout, and the posterior pair barely reaches beyond the tip of the abdomen. Acacia, Acer, Acineta, Allamanda, Anguloa, Anthurium, Antidesma, Aphelandra, Bletia, Brassia, Callicarpa, Callistemon, Calycanthus, Catasetum, Citrus, Clausena, Clerodendrum, Cocos, Codiaeum, Columnea, Cordia, Cupressus, Crescentia, Croton, Dendrobium, Dodonaea, Dolichos, Epidendrum, Euphorbia, Ficus, Flacourtia, Flaveria, Gardenia, Gongor, Hibiscus, Houlletia, Howea, Ilex, Jacaranda, Ligustrum, Liquidambar, Lycaste, Magnolia, Malus, Melia, Odontoglossum, Peristeria, Persea, Pilea, Podocarpus, Poinsettia, Rhododendron, Sida, Solanum, Stantropea, Tabebuia, Thea, Thunbergia, Trevesia, Trichophila, Vitis, and Wisteria. Brevipalpus mites inject toxic saliva into fruits, leaves, stems, twigs, and bud tissues of numerous plant species, including citrus. Feeding injury symptoms on selected plants include: chlorosis, blistering, bronzing, or necrotic areas on leaves (Childers et al. 2003). Injury to Pittosporum sp. is shown below. Figure 4. Injury to Pittosporum leaf caused by false spider mite, Brevipalpus sp. Stunting of leaves and the development of Brevipalpus galls on terminal buds were recorded on sour orange, Citrus aurantium L., seedlings heavily infested with Brevipalpus californicus in an insectary (Childers et al. 2003). Several mites in the genus Brevipalpus may transmit the Citrus leprosis virus (CiLV), but only Brevipalpus phoenicis has been experimentally confirmed to transmit the virus. However, Brevipalpus californicus and Brevipalpus obovatus also are suspected transmitters. (USDA 2004). Citrus leprosis causes yield reduction and eventual death of the trees if its mite vectors are not controlled. Citrus leprosis, while not currently a problem in the United States, substantially damaged Florida's orange crop in the early 20th century but was eradicated in the mid-1920s. However, it has been slowly progressing northward from its outbreak epicenter in South America (USDA 2004). 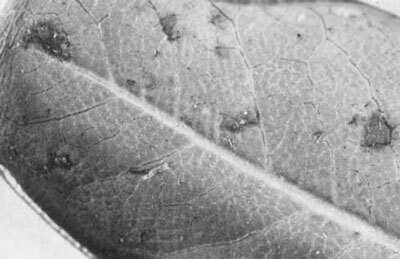 Look for necrotic areas on the underside of leaves and the presence of white molted skins or reddish, flat mites that move slowly when disturbed. In the past, sulfur was used as a control method for Brevipalpus spp. in Florida. The use of sulfur in today's management programs should be minimized given its toxic effects on beneficial arthropods (Childers et al. 2005). For UF/IFAS management recommendations visit Florida Citrus Pest Management Guide: Rust mites, spider mites, and other phytophagous mites. Banks N. 1904. Four new species of injurious mites. Journal of the New York Entomological Society 12: 53-56. Childers CC, French JV, Rodrigues JC. 2003. Brevipalpus californicus, B. obovatus, B. phoenicis, and B. lewisi (Acari: Tenuipalpidae): a review of their biology, feeding injury and economic importance. Experimental and Applied Acarology 30: 5-28. McGregor EA. 1949. 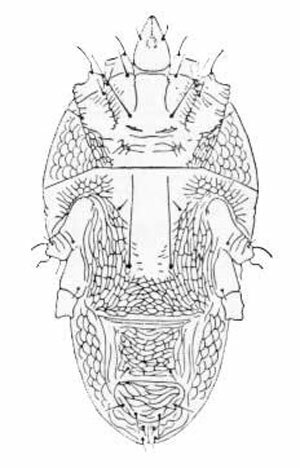 Nearctic mites of the family Pseudoleptidae. Memorandum of the Southern California Academy of Science 3: 11-36. Pritchard AE, Baker EW. 1958. The false spider mites. University of California Publications Entomology 41: 175-274. USDA. (2004). Targeting a threat to U.S. citrus mite-borne disease already has foothold in South America. USDA-ARS News and Events. (9 October 2018). Originally published as DPI Entomology Circulars 69 and 240. Updated for this publication.